In this week's Garden Plot, find some spring gardening tips, including where to find unique orchids, how to grow your own salads and the unexpected health benefits of pansies. Meet Mike and learn how to grow titanic and tasty tomatoes at Homestead Gardens in Annapolis; Saturday, April 6 at 11 a.m.
Those epiphyte espousers are at it again — or will be next Saturday, March 30, when the members of the National Capital Orchid Society hold its annual orchid auction in Chevy Chase. Three hundred rare and unusual orchids will be on view from 10 to 11 a.m., with the auction action beginning at 11. Admission is free; you’re guaranteed to see some truly amazing orchids — and frenzied bidding by orchid lovers. And maybe you’ll bring home a blooming bargain or two. The National Capital Orchid Society’s annual rare orchid auction is at the North Chevy Chase Christian Church, 8814 Kensington Parkway in — where else? Chevy Chase! You’ll find all the details on the Nationalk Capital Orchid Society’s website. Spring is finally in the air! And I have never seen people more ready for gardening season, so let’s discuss some to-dos to do now. If you covered your garden beds with mulch to protect them over the winter, remove that mulch now to allow the sun to warm up the soil. Just rake or hoe the mulch off the side for now. If it was/is a good mulch like compost, shredded leaves or pine straw, put it back into place after planting. If it was/is some god-awful dyed wood mulch, toss it into the woods and hope it doesn’t hurt the trees. After a couple of sunny days, the soil should be warm enough for you to start some spring peas from seed — snow peas, snap peas, English shelling peas — they all love growing in the mild weather of April, May and June. Read package descriptions carefully and/or go online to determine the final height of your plants. Some varieties top out at a tidy two feet, but most require a trellis, fence or ‘tee-pea’ to support the 6-foot tall vines. Are the later sunsets and other signs of spring getting you excited for planting something? You can sow the seeds of lettuce and other salad greens now — or, for a faster harvest, buy leaf lettuce plants at your local garden center. Let them grow for a few weeks, and when they reach about 4 inches tall, cut off the top 3 inches with a pair of scissors, wash the baby leaves well and enjoy a homegrown salad in April! Leave the cut plants in the ground and they will re-grow another run for you every few weeks. It’s a technique called “cut and come again” that maximizes the good eating you get from the plants. Are you enjoying the springtime displays of flowering bulbs like crocus and daffodils — with the first tulips not too far behind? Although spring bulbs are planted in the fall, it’s the care they’re given in spring that can ensure their glorious return year after year — or make them one-time wonders. After the flowers fade, use a pair of scissors to carefully remove the little seedhead that will form at the top of the central stalk. Do not cut the stalk down low and do not damage any of the plants’ green leaves. Over the next month or so those green leaves will absorb the solar energy necessary to grow the following year’s flower. That means that this is also the time to feed the plants with a gentle liquid organic fertilizer. No 10-10-10 or other explosive chemical nonsense! Note: If your spring bulbs produce only leaves this spring, it’s because you cut the leaves back too soon last year! Anxious to get something ornamental and edible in the ground? You get both when you buy a flat of pansies at your local garden center. They love growing in cold weather; they can even handle a bit of–dare I say the word–snow. And the flowers are not only edible, they’re the only real food source of rutin — a hard-to-find nutrient that can prevent or reverse the visible effects of spider and varicose veins! The best way to eat them is to arrange five to 10 flowers on top of a bowl full of lettuce and other mixed salad greens. Now, we should always presume that bedding plants might have been sprayed with something, so pull off all the existing flowers as you plant them. 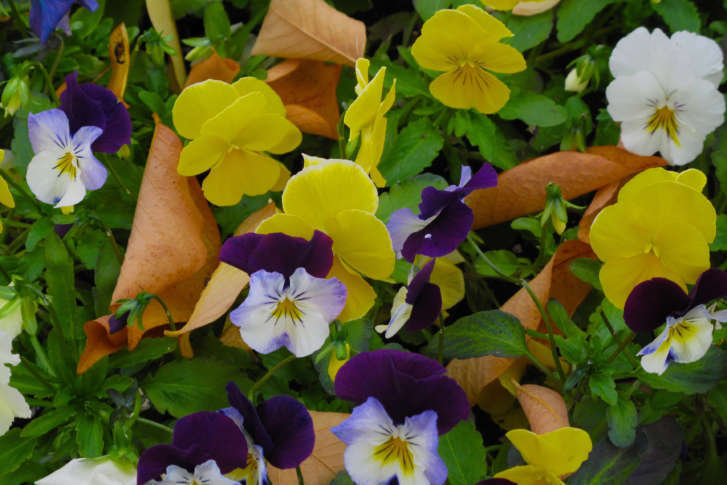 Don’t worry — they’ll grow fresh ones quickly — and picking those new flowers while they’re young will keep the plants producing the maximum amount of pansies for pickin’.